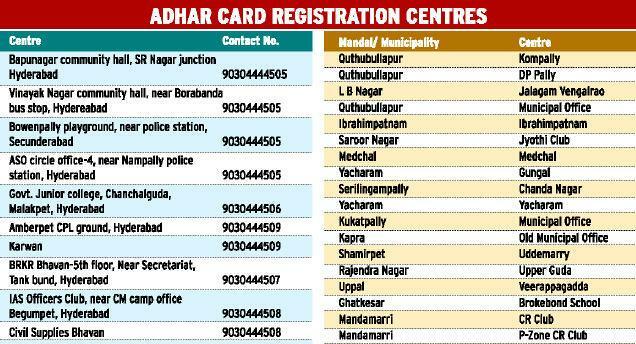 Aadhaar slot booking for all family members’ stars on 25-03-2013 Monday in Hyderabad District, Andhra Pradesh government step ahead to issue the Aadhaar card in a more convenient manner, previously Aadhaar slot booking only applicable for the person who have enroll for LPG gas, with that single person only eligible for Aadhaar slot booking online or dialing 1100 number through telephonic Aadhaar slot booking available. Now scenario is quite different Government has made it easy to book Aadhaar slot for all family numbers by online and phone, when you dial 1100 by phone booking Aadhaar slot now onwards the IVRS system don’t ask your LPG gas number for Aadhaar slot booking, with this facility Aadhaar slot booking very easy for all family members at a time, right now this facility available only in Hyderabad it will take few days to implement in hole state .Those who have internet they have good facility to book their Aadhaar slot by online from anywhere. 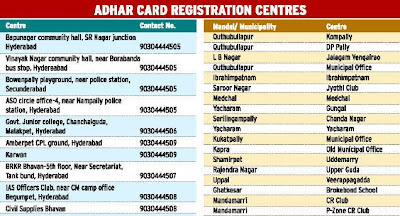 Once they book Aadhaar slot by online or by phone then they will get sms from UIDAI to which Aadhaar center they have to visit for Aadhaar enrollment process Aadhaar slot booking for all family members or Aadhaar slot booking by dialing 1100 currently this opportunity available only in Hyderabad district within couple of days it will available in Rangareddy district and all remaining areas of Andhra Pradesh state. Keywords: Aadhaar slot booking by online, Aadhaar slot booking by dialing 1100, Aadhaar slot booking for all family members.